I am conducting an experiment in our house. I have not purchased paper towels or napkins since January to see if we actually need them. Well we don't. Now don't get me wrong I'd rather soak up a potty training accident on the carpet with paper towels and throw it away and be done with it. But this is the attitude that has gotten our planet into trouble. So I adjust. I bought a pack of kitchen towels at Costco only because I wanted the 2 red towels to match the kitchen, I could care less about the other fruity prints ones. Well now the fruity prints have a purpose...they are now used for anything which I would normally use paper towels. We've been doing the cloth napkin thing for quite a while so that wasn't a big deal to get use to. The only time I relied on the paper napkins was when we had added guests at the table. Now that we live in MD surrounded by my family the added guests at the table happens more frequently (thanks goodness!) than when we lived in Seattle, WA. So today I went through my fabric stash and cut up some everyday napkins. I make children's clothing full time so most of my fabric is left over from a kid outfit, hence the bright colored fabric and police cars. 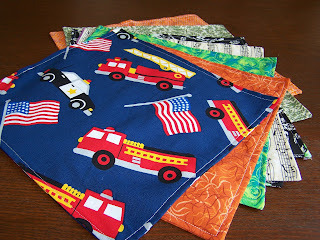 To make the napkins simply cut out 2 squares of fabric, sew them together wrong side facing out leaving yourself a small opening somewhere to turn the fabric inside out. Once you turn it inside out, iron and sew around the napkin again. I'm even thinking that instead of taking Logan to the party store to pick out his paper plates and napkins for his birthday party instead I'm going to take him to Joann's with my 40% off coupon in hand and have him pick out his favorite licensed character fabric to make everyday napkins that, for almost the same price, we can enjoy over and over again after the party! I love this idea!! We have been off and on about our cloth napkins but the added incentive of having kid material is a brilliant idea, for every day and for celebrations. Now if I could find trivia questions on fabric perhaps I could wean my husband of his awful addiction to paper towels! :) On the same note, we eat outside/grill meals all summer long and this summer I bought some very inexpensive reusable, dishwasher safe dishes that can withstand the use by my kids outdoors. I bought a huge stack of them, and added them to our towers of Ikea kid dishes, and some reusable plastic flatware... now I won't cringe daily when we enjoy a nice meal in the yard and there's nothing to waste! Thanks for the ever expansive ideas on how each one of us can help! I'm right there with you, Gretchen, on using cloth napkins and no paper towels. Recently, I decided to take it a step further and stop buying Kleenex. Instead, I've been cutting up old t-shirts to use on our noses. I'll be keeping them in an old tissue box in the bathroom. I know cloth hankies gross some people out, but if it doesn't bother you it's another good way to save some paper and trees :) And another good way to use up some old fabric scraps. I just listened to a radio talk show. The woman was talking about her company taking the green challenge...they had to carry around everything that could not be recycled for two weeks. My handbag would be full of yogurt stick packaging! I love those napkins. Might be a great new product for your site!